How was everyone's 4th of July weekend? I spent various parts of it glued to season 2 of Millennium, which I finished last night. I also caught a few fireworks on the way home from a family BBQ on Saturday, which was a pleasant surprise since I hadn't made any big 4th of July plans! It seems to have been a very dull year for most. I was on my way to the store and passed my local park, which was lined with firework onlookers. A quick u-turn allowed me to partake for a little while! I added a bottle of DaVinci chianti to my Saturday night, and it became a perfectly low-key evening. 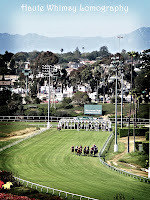 Sunday was perfection, as I spent the afternoon with family and friends at the horse races here in Los Angeles! There is nothing better than relaxing in the shaded sun with a light lunch and the excitement of making $2 bets! I've always had good luck, and now I seem to be getting the hang of just how to pick the winners, so next time I'll up the ante and bet $5 ... if I'm feeling brave! 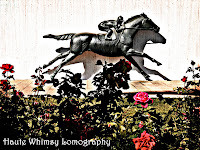 I added two new prints to my Etsy shop from the races, so please feel free to stop by and check them out! I can't wait to hear about your weekend adventures! Thank you so much for staying and leaving a comment! Hello! I saw that you were new to my blog and I'm sorry for being so horrible about not stopping by yours sooner! I love what you've got here and I'm looking foward to reading along!! Sounds like you had a fabulous weekend!! Jen laughing at the ingrate friends, boy we all feel like we have those at certain times. i had a so so one. bugs its all their fault man. Glad you had such a good one! Mine was spent at a Mexican wedding eating way too many amazing tortillas. Hi there! I just saw that you're a new follower of mine and I just had to pop over and say hi!